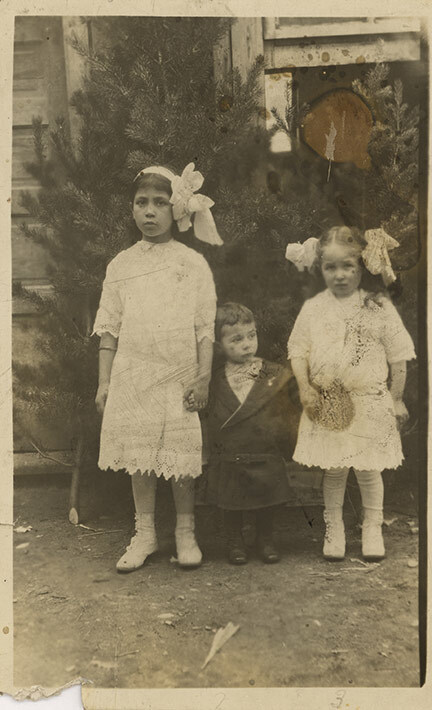 This is a black and white snapshot of Maria, Daniel, and Loretta; the children are about 12, 2, and 5 years old (shown left to right). They are the children of Leopoldo (Leo) Mascioli. Maria is wearing a white knee length dress with a crochet pattern. The sleeves of her dress run just to her elbows and her right arm has a bangle. She has white socks, white shoes, and a white headband with a big bow. She is staring at the camera with no expression on her face. She is holding her younger brother's right hand. Daniel is staring off to his left. He has a dark coloured suit jacket that is a bit big for his size and black boots. A high collared shirt peeks out from the jacket. Loretta is wearing a similar outfit to her sister's but has on tights instead of socks. Her hair is styled in pigtails, each with a big white bow. The children are standing on a dirt in front of a wooden house or building structure. Behind the children and resting against the walls are cut fir or spruce trees.